Capitano is the largest beachfront home in Destiny by the Sea. 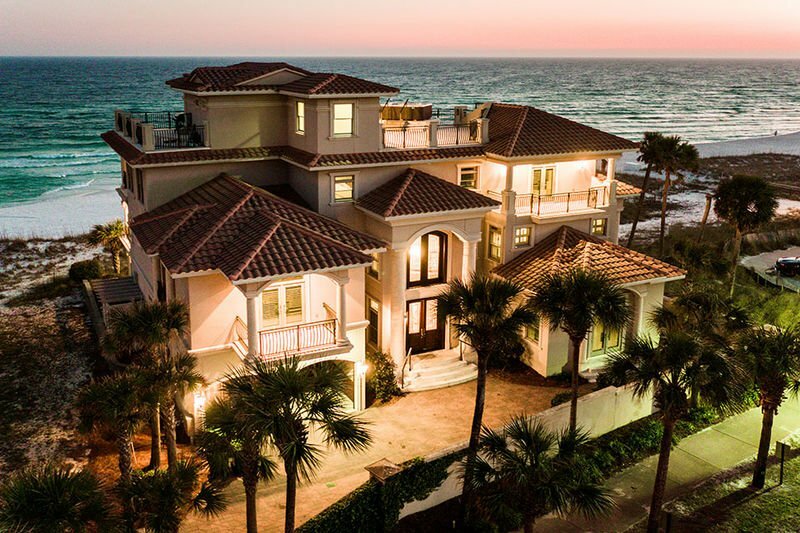 With 8,800 square feet of exceptional living space, expansive balconies overlooking the Gulf of Mexico, a rooftop deck and hot tub, and awe-inspiring architecture, this unique showplace is nothing short of magnificent. Luxury finishings and features include a free-standing balustrade curved staircase, Corinthian columns, and marble and granite countertops. Each room boasts a beautiful view of the Gulf or the nearby lake and provides comfortable sleeping arrangements for all guests. With all of the features and amenities this home has to offer, extravagant, coastal living will be right at your fingertips. The greatest room in the Capitano mansion is the grand master suite which takes up the entire third floor of the home. Featuring stunning, panoramic Gulf views, a private sitting room, and a lustrous bathroom, this part of the home is the creme de la creme. The king bed faces the Gulf directly and provides stunning views through a wall of glass double doors. A two-way fireplace caters to the bedroom as well as the sitting area that comes complete with a sofa, small table, and a full bar with a mini-fridge, coffee pot, and sink. Just off the sitting area is a private office that faces the Gulf head-on. Walk through double doors into the master bathroom that provides guests with a jetted tub with Gulf views, a standalone shower complete with a rainfall showerhead as well as a shower detachment, and a water-closet with a bidet. The walk-in closet presents built-in shelving on every wall and ample space for clothing and shoes. A guest suite is also located on the fourth-floor rooftop deck and is furnished with a king bed, a full bar with a mini-fridge, ice-maker, and coffee pot, and shares a bathroom with the rooftop deck. The rooftop deck is where guests can enjoy the best views in the house! 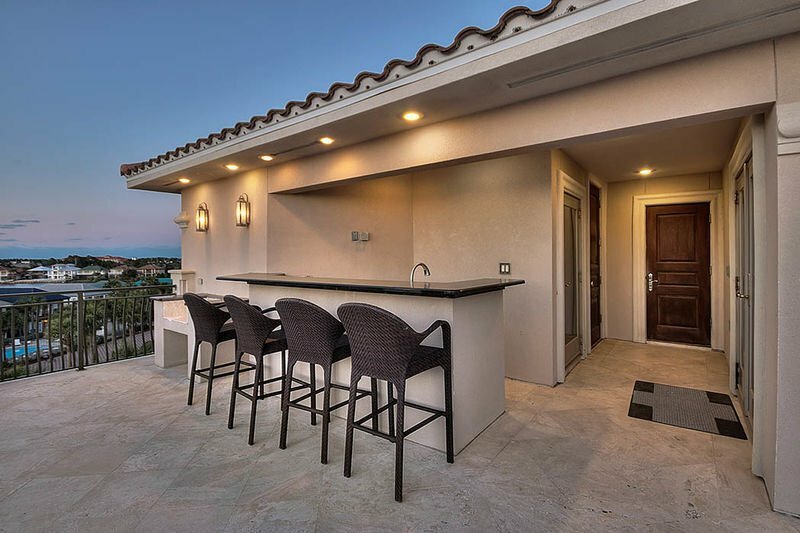 Whether you’re relaxing in the elevated rooftop hot tub or entertaining guests at the built-in bar, this space will be used daily. Sunsets and evening views are unlike any other and you’ll find that perhaps days spent close to the ocean, and nights under the stars are what will make you feel the richest. Experience luxury coastal living at Capitano! *An additional pool heat fee is required for use of the spa tub or to heat the pool, and must be arranged in advance of your stay.